Harbormaster Bezel Tee - Orange - STØLÅS Watch Co.
Click the button below to add the Harbormaster Bezel Tee - Orange to your wish list. Grab yourself a hot STØLÅS TEE! This T-Shirt features our full logo on the front in our Genoa Orange and white. 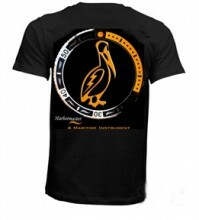 The back showcases a Supersized Harbormaster Bezel around our lightning Pelican logo. This shirt is 100% cotton and machine washable. The perfect shirt to show off your Harbormaster with! STYLE: We carry two styles of this shirt. The "Normal" style is a thicker 100% cotton stirt & the "Light Weight" or "SLIM" is a sheer lightwheight 100% cotton that looks great and is form fitting for both Male and Female.